I finally had to get rid of my Lexus LS400. It has been 9 years with this car. I purchased in Oct 2005 for a little over $20K with around 47K miles. 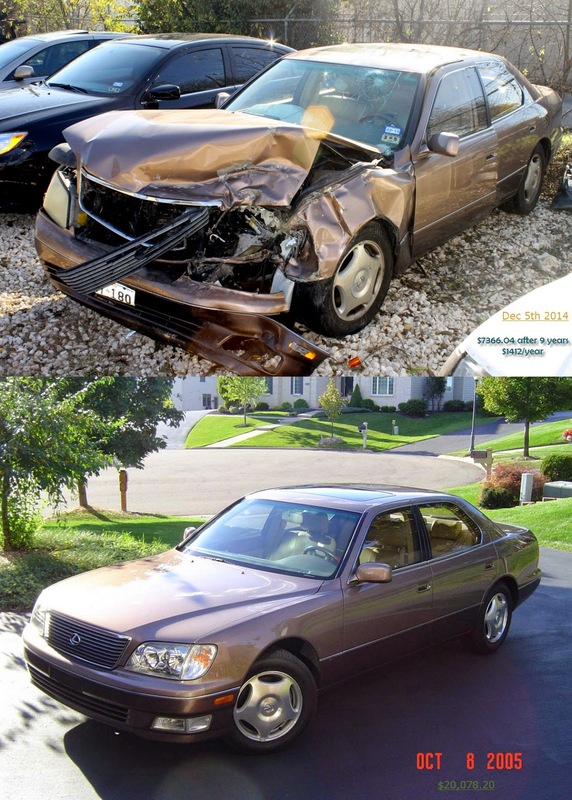 It got into a wreck in December 5th, 2014 with around 180K miles on it. The insurance paid me $7,366 for it. It depreciated at $1,412 per year or about $118 per month. It pays to drive a car into the ground, much better than leasing in the long run. Plus I only purchased liability insurance, so I saved at least $1K per year on that. Martha was driving the car when a 20 year old girl was trying to make a left turn. The girl thought she could make it, but obviously she had bad judgement and Martha ran right into her. Her Dad's insurance was State Farm and they settled the property claim in about one week and even offered a rental car. We never took the rental care because Martha could not drive for at least a month. I thought the price was fair. Martha's claim will take longer as all medical bills need to come in. The other party have assumed fault and will be paying for all medical, lost wages and pain and suffering.